Performance Engine Compartment Upgrade Kit with evaporator. This kit is engineered for your 76-79 F-Series Truck/Bronco with factory A/C and Ford V8 engine with original compressor mount bracket, idler and idler bracket. 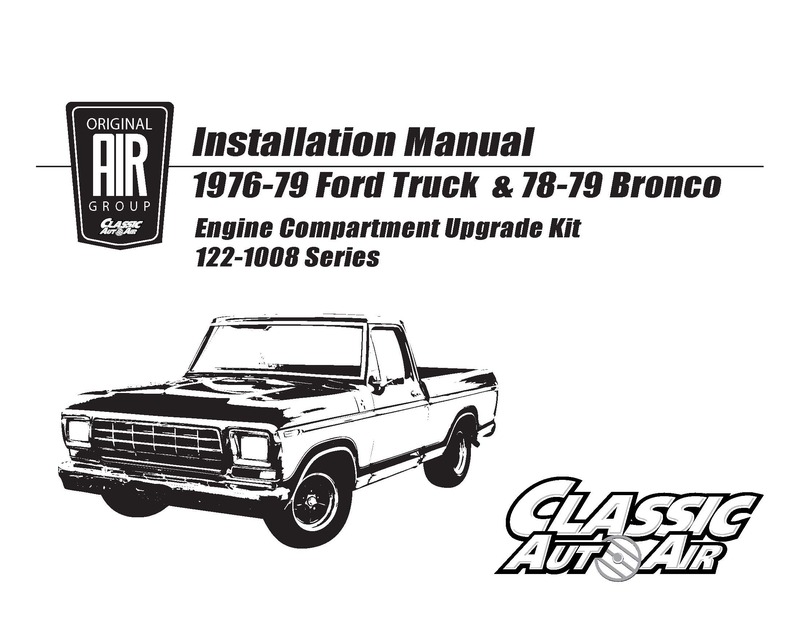 Everything you need to convert your factory air-conditioned 76-79 F-Series Ford Truck / 78-79 Bronco from the original compressor to an ultra efficient rotary compressor and parallel flow condenser with 134a. Modern air conditioning systems are more efficient largely because of improved condensers & compressors. Original Air’s high performance engine compartment upgrade kits serve as an easy way to replace your out-of-date leak-prone compressor & antiquated condenser with an improved high-performance parallel flow condenser and rotary compressor to connect to your car’s original factory AC system. Stop Annoying Shaft Seal Leaks. The original York & Tecumseh compressors have a strong tendency to leak at the shaft seal if the air-conditioning is not used on a regular basis; sometimes in as little as two weeks of non-use! This will not be a problem with the Sanden-style rotary compressor. Converting to 134a? You get everything needed to convert to 134a except the refrigerant itself. Highly efficient direct replacement parallel flow condenser, along with a rotary compressor will help with system efficiency that is lost when converting your system from R12 to 134a. Save Horsepower. Our rotary compressor draws significantly less horsepower of stock compressor; approximately 2-4 horsepower compared with 5-10 horsepower from stock. Increase Fuel Economy. Less horsepower draw means better gas-mileage. Save Weight. The rotary compressor is about half the weight of stock compressor/clutch assembly. Running engine at high RPM? The compressor can handle 6,000 continuous RPM! WHAT DO I GET WITH THIS KIT? Rotary compressor & clutch assembly. Compressor Mount Adapter bracket - Designed to allow the new compressor to sit on the original factory A/C Compressor Mount. Idler Bracket Adapter - Allows the original idler bracket to attach to the top of the new compressor for support. High-performance "Parallel Flow" Condenser that installs as original. (This replacement set does away with the original style sightglass & quick disconnect fittings, which eliminates possible leak points between the line and hose connection). *Hoses supplied with one end open, along with the corresponding fitting and cutting/crimping instructions. Your local hydraulic shop can provide crimping services, or we can provide the crimping service for an additional fee. Instructions for both options will be included. All the tech support you need! Any stock 302/351M/360/390/400/460 engine with the original compressor mount, idler and idler bracket. DOES YOUR CAR HAVE A DIFFERENT ENGINE? Please call or Email for more information. The average hobbyist can install without difficulty. General rule of thumb is if you change your own parts, you can change these parts. It is recommended, however, to have the system evacuated & charged by a professional.